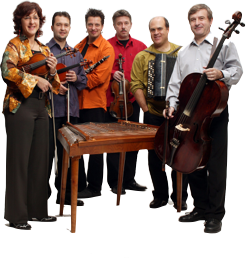 Budowitz is the groundbreaking traditional ensemble of klezmer music. Since its founding in 1995, Budowitz has featured over 20 musicians in its performances and recordings, including the late Jewish cultural icons, Cili Schwartz and Majer Bogdanski. Their third CD, Budowitz Live, has just been given the Songlines Magazine “Top of the World” award, and their prize-winning previous CDs are featured on all of the international compilation CDs of the best klezmer groups. The music of Budowitz features kaleidoscopic renditions of folk music molded into the unique personal group style from the regions of Bessarabia, Galitsia and Bukovina, performed on tsimbl (Jewish dulcimer), 2 violins, 3-string viola, 19th Century C andd Eb-clarinets, early bayan (button accordion from 1889), bassetl (shoulder strapped cello) and baraban (drum). The rare repertoire of Budowitz includes pieces gathered through intensive fieldwork in more than 15 countries and includes not only ritual and dance music by Jewish folk composers of the 19th Century but also original works by all the members of Budowitz. Budowitz has won numerous awards for its accomplishments, among them BBC’s Critics Circle award for best CD, the Belgian Gandalf Award for Best Concert and The Viennese Fritz Spielmann Award. Budowitz has been featured for over 10 years on full-length radio and television shows in Europe and the U.S. The ensemble served as the cultural ambassador of Austria for the millennium celebration of Berlin’s House of Cultures Festival and was invited to commence the opening of the acoustically renowned Luzern Kongresszentrum. They have been featured in concerts worldwide at the most prestigious venues, such as the Amsterdam Concertgebeouw, The Vienna Concert Hall and Queen Elizabeth Hall in London. Budowitz is a favored klezmer group among radio stations and print media journalists. Their archive has also served as the main resource for West German Radio, Radio Bremen, Swiss National Radio, Deutsche Welle and countless others. Their music has been featured in the award-winning British film, “Some of my best friends are... Jewish / Muslim” (Sandford St. Martin Trust Religious Broadcasting Award) and in the new film by Jes Benstock, "The Holocaust Tourist."